No Country for Old Men meets The Three Amigos. Fistful of Reefer delivers a surge equivalent to a cocktail of 1 part serotonin, 2 parts adrenaline, with a dash of grenadine served over ice. It scratches the urge primeval. Combining the smooth consumption of a beach house page-turner with the kick to the face of a summer blockbuster movie, this double-fisted, dieselpunk weird-Western resides between No Country for Old Men and The Three Amigos. 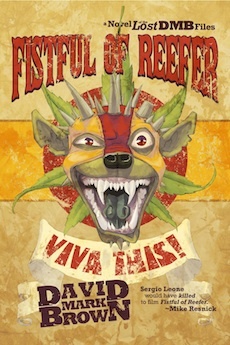 Snag Fistful of Reefer along with 5 other ebooks in the FREE DMB Primer Library! Better yet, buy all 10 Lost DMB Files for $9.99. That’s a 55% discount! View more books in the genre "pulp". View more books in the genre "western".